I wrote a couple of weeks ago about what I've been reading lately. At that point, it was mostly essays, non-fiction, and toying with the idea of a novella. Unfortunately, things haven't improved with my surroundings. But I finally got going with some contemporary novels that were and are really doing it for me. I am a little bit surprised by this because I was really hesitant to read much of anything that wasn't a classic or wasn't a contemporary piece on the Rory Gilmore reading list. Mostly because I'm picky and I don't want to waste my time with something that just isn't worth it. I still feel that way, but I don't have such a narrow view on what I should consider picking up. As I try to trace the evolution of this development, I have hazy thoughts about its beginning. I think it started with me picking up the latest IT book for the past couple of years. Whenever a book was super, super hyped, I'd wind up buying a copy, believing that it was going to be really great. The few times I started reading the book, I felt let down. A couple of others, I wound up setting in the donate pile without ever cracking the cover. I beat myself up over this for a while, but I finally accepted it, forgave myself, and moved on. Because life is too short, especially to be beating yourself up about something you love doing! Ever the optimist, I kept trying. I'd still look at the latest IT book, but I wouldn't necessarily knee-jerk buy it. I'd read the synopsis. Sometimes I'd wait for the hysteria to die down and try to enjoy the book on my own. Other times I decided to pass on the book. However, I've found four contemporary books that I am super, super excited about and have been rotating because I just want to read all of them at the same time. If I could literally read four books at the same time (like have four monitors to simultaneously watch) I would. But I have to pick one to focus on each day. 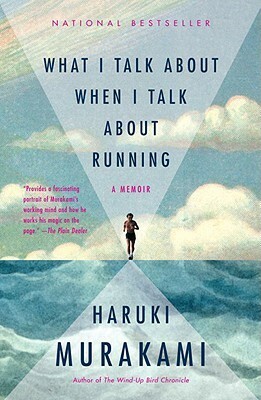 What I Talk about When I Talk about Running by Haruki Murakami OK--non-fiction, but it's contemporary. I've written before about wanting to run. I'm seriously finally going to do it. I have heard about this book before, but never really got a clear picture of what it was about. The other day I impulse went to Barnes and Noble to buy this book. I've read a few chapters and really like all of the correlations between running and writing, which is great because I really want to work on both of them. Coincidentally, this is also my first Murakami. It's piqued my interest in his other works, which are contemporary fiction. 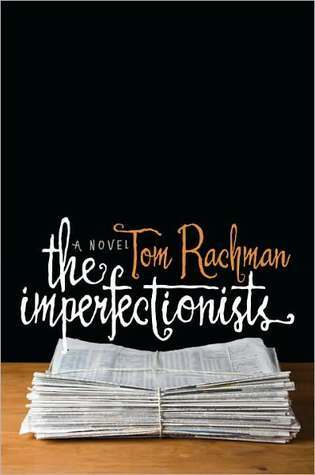 The Imperfectionists by Tom Rachman When I went in to Barnes and Noble the other day, I picked up a Raymond Chandler book. Then a bargain book of essays. Then I saw this one and impulse bought it as well. I saw the New York Times Book Review Notable Book of the Year label on the front first. Then I saw the words "English-language newspaper in Rome" and I had to buy it. I figured that it was set in comtemporary times based on the chapter titles, but ever since I first saw Roman Holiday, with Audrey Hepburn and Gregory Peck I've had a thing for English-language newspapers in Rome. I read the first chapter and love the gritty, deep style of the author's language. I can't wait to read more. 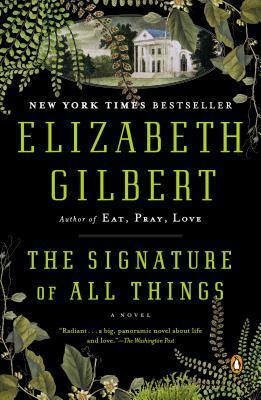 The Signature of All Things by Elizabeth Gilbert You'll be seeing me mention this book in next week's Top Ten Tuesday...I'm about halfway through. I bought this book immediately after it came out and it just sat around for a year. I think that this was finally the right time to read it. I am falling completely in love with the language and the style. I think Gilbert has done something great here with this sweeping epic story. Alma is a very interesting and inspiring character as well. The secondary characters are also very strong, detailed, and interesting. I cannot wait to see where this one goes and hopefully I can find the time to finish this weekend! Lucky Us by Amy Bloom I haven't gotten the chance to pick up this one yet. But I am really looking forward to starting. It's about two sisters in the 1940s. They travel to Hollywood. New York is involved. I LOVE reading about or studying these two places at this time. And who doesn't love a good girl power adventure? The cover is gorgeous. If I weren't so embroiled in the Gilbert, I'd be all over this. I am so happy that I finally decided to step out of my comfort zone and try all of these amazingly interesting books. I hate to think of what all I might have missed out on. That's not to say that I am abandoning my classics, but right now I need language that is not so dense as that of the nineteenth century or prior. Any good contemporary literature that you want to recommend? Good for you, Lori. I hope I can have a half of your bravery to try new things. I feel that I already fell into my comfort zone too deep and refused to try any other things. I'm such a believer in trying new books that take me out of my comfort zone. I really hope these books open up some exciting new reading experiences for you. I'll look forward to future reviews. I hope you continue to like The Imperfectionists! I read it and I enjoyed the writing style and the various stories told and how it all works together. A contemporary literary novel I recently read that I would recommend was Where'd You Go Bernadette; it's told through a series of emails, briefs, and narratives and makes for an interesting read, about a girl trying to figure out what happened to her mother. I hope you continue to find things that you enjoy reading! Two books with contemporary settings that have impressed me lately have been: Lost Legacy by Annette Dashofy (mystery-thriller) and The Wedding Soup Murder by Rosie Genova (cozy mystery). I have been meaning to read The Signature of All Things and I can't wait to hear what you have to say about it! I love all of these books you've mentioned, so this is exciting, Lori! Two books I would highly recommend, even though they are not so recent: The Art of Fielding, by Chad Harbach and The Marriage Plot by Jeffrey Eugenides. I also agree with Sarah, above, on Where'd You Go Bernadette; that was a good one! Thanks for sharing! I love your list and am adding the ones I haven't read to my TBR list. The Sixteenth of June by Maya Lang is my recommendation (reviewed on my new blog here: http://charlestonliteraryreview.blogspot.com/2014/09/the-sixteenth-of-june-by-maya-lang.html). It's similar to Marriage Plot in that it follows three twenty-somethings, but I found it much more enjoyable. I liked Lucky Us. At first, the title seemed like a joke--the family is supremely unlucky. But it's beautifully written and has inspired me to read the rest of Amy Bloom's books. 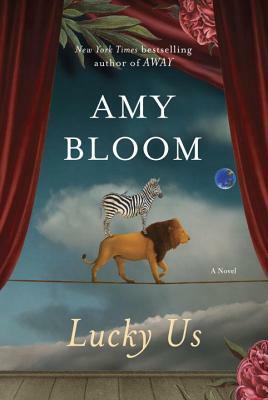 I reviewed it here: http://charlestonliteraryreview.blogspot.com/2014/09/lucky-us-by-amy-bloom.html. I hope it's ok to mention my blog. I'm a newbie and very excited about it! Would love any advice from you veterans.